This article is an One Piece Kaido Theory, analysing interesting ideas about the fully mysterious until recently Captain of the Beasts Pirates. He is known around the One Piece universe as the Strongest Creature in the World, certainly a title that promises a lot. It has been said that his crew currently occupies the Wano Country. The most crazy thing about him is that he supposedly cannot die. That has made attempting suicide his hobby. What’s so interesting about his past is that he has been defeated seven times and was captured by the Marines and the Yonko eighteen. Forty times he was sentenced to death, but no way of execution was able to kill him! At some time in the past, he defeated Gekko Moria and his whole crew. Furthermore, he possesses a Road Poneglyph, one of the four poneglyphes, which when deciphered will give the location of Raftel! Lets briefly analyze the epithet by which he is generally known in the New World. What can Kaido of the Hundred Beasts refer to? You guessed it right! The most probable explanation lies in his crew. Kaido was working along with the scientist Caesar Clown and Doflamingo, who provided him with Smiles from his Smile Factory in Dressrosa. What are Smiles you may ask? Smiles are artificial Zoan devil fruits. You must already see where i’m heading with this. He uses the artificial devil fruits, in order to build an army of powerful zoan devil fruit users. That’s where the term Beasts comes from of course. We can realise the importance of this, as zoan devil fruits are considered extremely powerful in the New World, amplifying the power of haki. One of the first times we witness Kaido in action is when he attempted suicide once more. This time he fell from a Sky Island, but his efforts were in vain, as he survived to his disappointment :P. Fate had other plans for him, as he fell at an island where Eustass Kid, Scratchmen Apoo and Basil Hawkins were. The outcome of that fated meeting didn’t go well for Eustass Kid. We don’t know the details of the encounter but we do know some results. 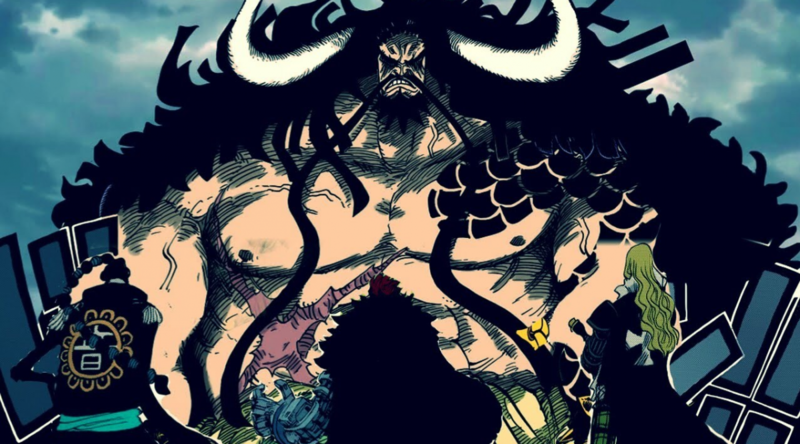 Scratchmenn Apoo appears to have become a subordinate of Kaido, joining his crew. Another member of the Worst Generation who has joined his crew is Drake, quite logical as he possesses an ancient zoan fruit. What happened to Basil Hawkins is unknown, but we do know about Eustass. The Supernova with the highest bounty pre-timeskip, and the third highest post-timeskip, only after Law and Luffy, lost easily to the mighty Yonko. He is currently locked away in a jail cell, beaten to a pulp! From that only, someone can understand just how ridiculously powerful Kaido must be. Someone can understand the type of person Kaido is(or maybe has become through the years), by his recent aspirations. He has stated that he wants to start the biggest war that ever happened. You could say that this isn’t that groundbreaking from the mouth of a Yonko. And you would be right. What is important to note is the reason he wants to start this war. You may speculate that he wants to find Raftel, throw off the World Government or beat the Marines. And you guessed wrong! His only motivation behind starting the biggest war there has been, is that the One Piece World recently has been boring! Well, that’s who Kaido of the Hundred Beasts is. The most probable enemies Kaido will clash with in the near future must be the Straw Hats and Law alliance. They were the ones who angered him by destroying his artificial devil fruit supply after all. They had other motives but the result was the one we know. 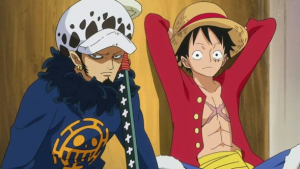 Moreover, Luffy has stated that he will take down all the Yonkou, so Kaido could be the first in the row. We don’t really know the devil fruit he has eaten(or that he’s eaten one for that matter), so we can only speculate. A devil fruit that would be really fitting for the King of Beasts would be a Mythical Zoan, and especially a Mythical Zoan of a dragon. It goes along quite well with his appearance, his mustache having a weird dragon-like shape and if that wasn’t enough, his tattoos resemble the scales of a dragon’s skin. We can also notice that his powers could have their roots at a dragon devil fruit. He is immortal, as dragons were in ancient chinese/japanese mythology and there is a possibility that he can fly. After all, we saw him skydiving from a sky island. What if he got there flying? Wouldn’t it be easy for him to suicide? Someone could easily ask: “If he has eaten a devil fruit, it would be easy to kill him when in custody by throwing him in the water. Even more so than that, it would be quite easy for him to suicide by getting into the sea.” There are three possible explanations about that. It could either be that he wants to find a way that he can kill himself that will thrill him. Wouldn’t it be boring if he just drowned himself? :P. Another explanation is that water actually doesn’t kill devil fruit users. Could it be that it just weakens them and they lose their powers? Quite possible. A third idea that comes to mind is that the dragon devil fruit is the only one without a weakness in the water. That goes along with the fact that dragons in ancient mythology were able to stay under water. 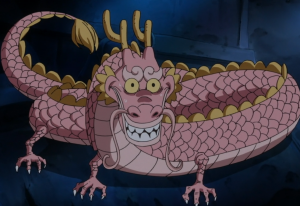 Another fact that contributes to the dragon devil fruit, is that dragons in ancient japanese mythology were the rulers of the four seas, just like the Yonkos. The thing is, we have already seen a dragon devil fruit, Momonosuke’s. Well, it is possible that one of the two devil fruits is an artificial one. It could be Momonosuke’s, but if it was Kaido’s, what if it was artificially enhanced to be even more powerful than the real one? The other idea is that there can be a simple dragon devil fruit and a mythical zoan one, in this case the one Kaido possesses. So, to wrap up, that was today’s One Piece Kaido Theory. What is your opinion guys about the King of the Beasts? Share in the comments below. p.s. If you liked what you read just press the like button to the right and stay updated with our newest posts. Also, check our recommendations page, for interesting One Piece and anime/manga stuff. Really informative article. 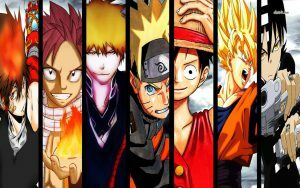 I remember One Piece as a kid but I’ll confess I really don’t know much about it or the manga universe for that matter. I’ve had a lot of friends that have been into it though. If I were looking to learn more about One Piece, do you have any articles in mind that would help a newcomer digest the basics? Hey Alec! Thanks for stopping by. 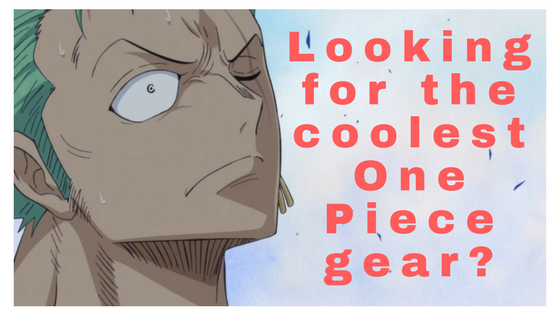 You can navigate this website’s articles for more advanced concepts concerning one piece. It’s really easy to get a headstart in the anime through the one piece wiki, which is really comprehensive as well. Don’t forget to tell your friends about onepiecetheories :). Hope i helped. Cheers! another possibility about the immortality of kaido is the devil fruit that Law has. Or to be more accurate the previous owner of that fruit. It is said that this fruit has a power that can give to another person immortality with the cost of the users life. So what if the previous owner of the devil fruit used that power on kaidu wellingly or not ? I think that this is an interesting theory !! Hi! I know nothing about this Kaido, but appreciated the story which you made very interesting and surprising! Thanks for sharing. Ciao! Interesting theory about kaido’s devil fruit power. Now I think about it, this may be correct !! Glad you liked it my friend! I think, Momosuke eat “smile” fruit of Dragon when he eat at Caesar Clown lab. Oh, so you mean he didn’t have the abilities before? Could be! Never thought of it!